Bigger and better for detangling long, thick hair. 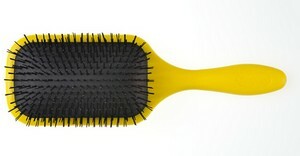 Super-soft nylon bristles gently glide through the hair removing tangles. Air cushioned pad follows the contour of the head for smooth, damage-free grooming. Lightweight and comfortable Denman handle. Perfect for use on hair extensions and wigs.